Identities cover the status and vocational orientation of an individual. The formal of the sixteenfold identity of the status-orientation is settled to the four vocational interests of being a friend, a provider, an initiator, or a person of guidance and the four agegroups constituting the status: youth, young-adult, middle-aged and old-aged. Four by four there are thus sixteen basic identities. To play the game, pick an identity below and surf on to your mission. Identity means the being identical to oneself, to the same continuing life, the sameness of essential character. It usually refers to the image people have of oneself and the accordance of that image with the way one sees or wants to see oneself. Familiar with oneself, there are positive identifications. The opposite is defined as estrangement. Formal identification is called problematic as the real (unique) person seems to disappear in the uniform of a group. Materially the term refers to being properly oriented in one's selfimage to the here and now in the space-time of one's body. Being disturbed in this belongs to the definition of mental illness: one is depersonalized or disoriented not aware of one's responsibility for the place and timing of one's own body. Filognostically mankind is known to suffer an identity crisis being - politically - split up (divided) in the awareness of place and time: the international pragmatical timesystem threatens to devour the person and his culturally authentic identity in his feeling of natural timing to his own place (the soul of that being denounced as a bad or nationalistic ego). Therefore one is filognostical considered self-aware having realized a formal (material) identity without losing oneself in the uniform or other behavior of a group. 1) The partner files for a marital divorce because mister director is unable to function as an equal partner: he took his work home. 2) A therapist ends himself up in a divorce because his companion cannot accept his guidance. 3) A politician falls down because nobody recognizes him as a friend anymore. 4) A person originally born in another country has, despite of his talents, difficulty climbing up in society because he over-identified himself with his ethnic identity and thus estranged from others. The question now is to what extend different identies may converge. What would be the good and what the bad of such a thing? The basic identities as described are defined by people's age and their societal function. Age is an absolute fact. A societal function nobody can be denied. One's color of skin and sexual preference are trivialities though that cannot be considered as essential or necessary for discriminating between people in their normal societal contacting. This form of discrimination, positive or not, is consequentially forbidden by constitutional law in many counties in the world and resort in our filognosy under the concept of false ego: to identify oneself falsely with externalilties. In the combination of the two formerly mentioned identity characteristics we see in their handling a certain confusion rising. That confusion essentially means that someone who is older encloses in his later integrity his previous stages of development. That not being the case one should worry. An elder estranged from the youth and innocense of his earlier days one may consider a victim of a repressive kind of progress. Even so it is with the societal functions we also know as described in terms of strata or societal layers. One layer is superimposed over the other. Thus one finds education and spiritual guidance positioned above the administration of civil servants and popular representatives. The administrators are, legally and economically regulating, necessarily positioned above the entrepreneurs who provide services and goods. And the business managers have to direct the comrades, the friends who lend a hand as employees. Thus a hierarchy of identities can be acknowledged in which someone higher in the hierarchy always covers the lower identity given a healthy, non-repressive personal and collective development. Below the 'societal belt' we thus get to see is then segregation and association taking place in the descending from and the ascending to a better personal integrity. And above the societal belt of a reasonbale degree of identity formation is there then integration and delegation in the direction of and the moving away from the vested spiritual authority. Thus seen is there a kind of cycling identity development around a societal nucleus of civil leaders, managers, directors and politicians. Acknowleding that one thus has a clearer notion of what would be a healthy identity: a priest who is still capable of being an equal partner or a comrade in delivering service. A directeur who still knows how to offer a helping hand himself and as well is able to assist someone without any bossing around. We then speak of a sane form of handling different identities. From the top to the bottom is the matter of having a double identity something more natural than from the bottom to the top. An employee will not so easily take the place and assume the role of a director. And a partner will not as easily be capable of taking over the duties of her husband in politics. Also that is considered something integer, normal and sane. Things then assume the appearance of the table above raised on one point. 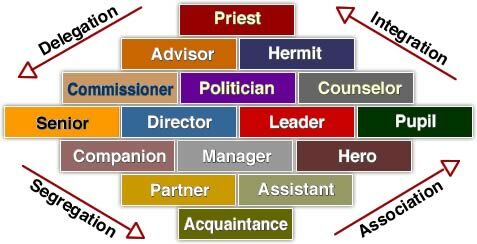 The top identity of the priest encloses all roles and the newcomer appearing as an acquaintance in the societal game of order without him having developed much relations and engagements, is still of a very single natured, minimally pronounced identity. In the top position must each and everyone be able to recognize himself reresented, or else will that person come to a fall in that function. In the lowest position must one be strictly identity conscious in order not to create any negative confusion or be assuming unjustly some position, in order not to take any false stance in such a way that the established societal order - often a pecking order - would be undermined. And that's the way things are in the matter of having several identities and to be sane with it. 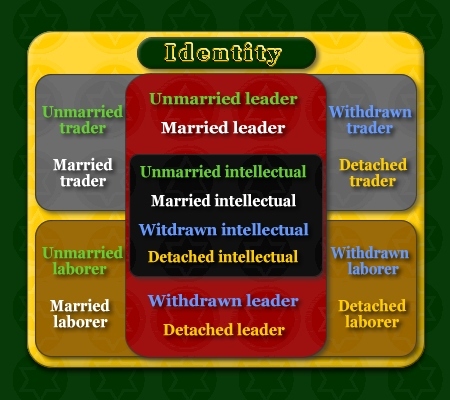 The falsehood of the civil status-orientation of identity is checked in the eight levels of abstraction that offer the transcendence or the metaphysical and thus facilitate the freedom of choice and relativizing that one needs not to end up in a class-struggle or a caste-system. This transcendence is accompanied by a certain understanding for the necessity of the different operators, or functions, of the identity at each level and to each degree of commitment or mode of experience (self-ego-soul), to which is found a refinement in 24 identity-functions. Identification devoid of the motives of the soul is considered the cause of attachment (which leads to a loss of intelligence). The colorcode settled for the identities.